"The Ideal Property Management System." YES! There is even an UNLIMITED version of Tenant File program which allows you to keep up with an unlimited number of properties or units. Many of you have already grown beyond the 100 unit version (or plan to) and have asked if there is an even larger version available. This UNLIMITED version has all the features described in either the 10 unit Landlord Edition or the 100 unit version, plus as stated, it can handle an unlimited number of units. You can even try a Sample Program for free by downloading it at: CLICK HERE!. All versions can be run on Windows Vista, XP or Windows 7 and 8. Thanks to a special arrangement with the developer of the program, owners of this Tenant File Prog�ram, you are able to order the latest unlimited version (Version 8) for the discounted price of only $399.95 (The regular price is $477.95). The UNLIMITED version of the software also comes with free phone support. Order now and receive the online discounted "MrLandlord/com" price of only $399.95. 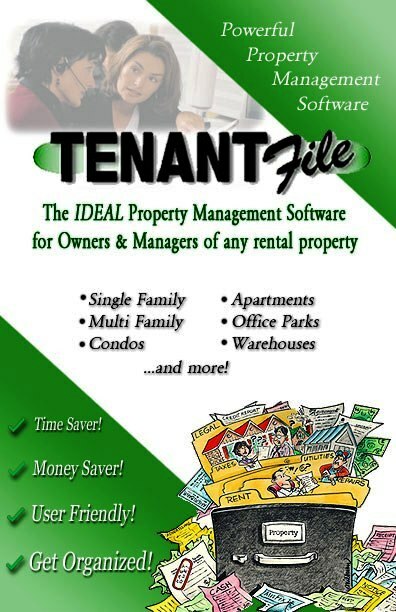 To order the Tenant File Unlimited version at the online price for only $399.95, click now to add this item to your cart. Please note: Tenant File is now available by download only. Since this is a downloaded program, there are no refunds on the version 8 software. Regular price of this software is $477.95. By ordering through MrLandlord.com, you save $78. After placing your order you will receive an email with 24 hours of the next business with instructions on how to download the software. Your price through us is only $399.95 (better than what you can even get directly from the Tenant File website).